You can believe that it is over but you are mistaken. 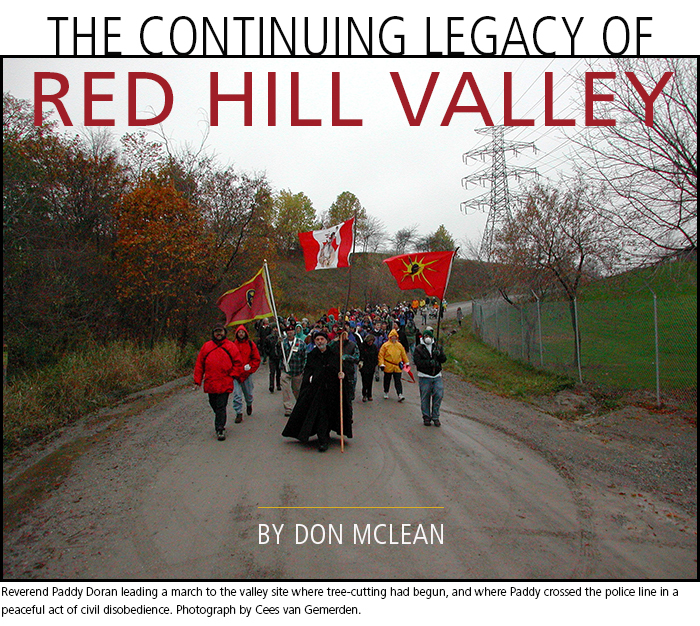 The decades-long struggle to defend the Red Hill Valley continues today despite the claims of those who pushed an expressway through its heart and those who as a result concluded it was unrealistic to work for something better. The thousands who voluntarily gave freely of their life energies and resources in defence of the valley over more than fifty years understood what was important for themselves and Hamilton – and it wasn’t land speculation, more construction work or the personal convenience of maybe getting faster from one place to another. They didn’t buy the ideology that the natural world must be sacrificed to provide jobs and economic growth. They refused to capitulate to the received wisdom of the day that stopping the expressway was a lost cause and an unrealistic dream. And their resolve was only strengthened when faced with the ugly anti-democratic measures taken by local elites – a classic indication of how much the powerful were frightened by the united response of those they claimed to represent.